I was waiting in line for the Wonder Wheel at Coney Island. I had just spotted the turnstile for the pay toilet with its garish red and yellow paint job and 25 cents sign in early 20th century lettering and was composing a photo on the ground glass of the Rolleiflex. 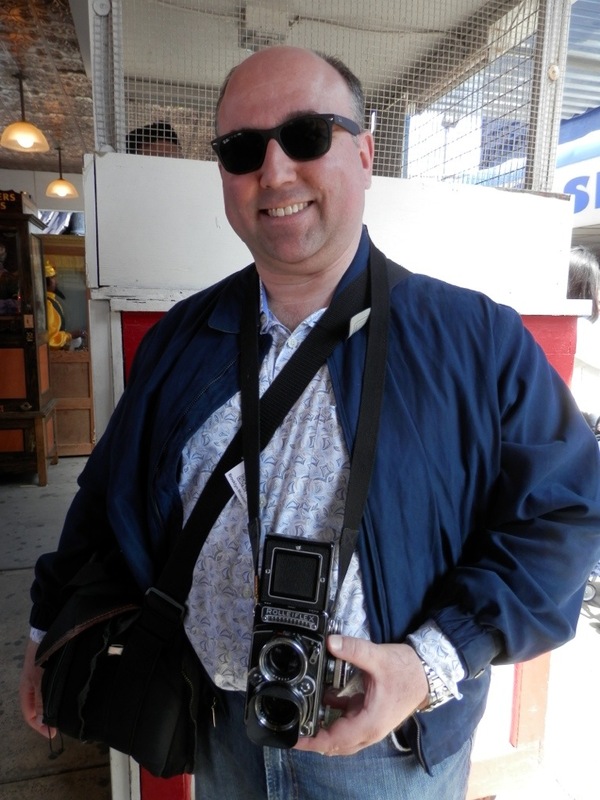 A voice called out to me, “Oh, that is a lovely Rolleiflex!”. I looked up to see an older gentleman with a souped-up walker (metallic paint job, hand brake, and a fold-down seat). We struck up a conversation about cameras and photography. He had been a camera salesman at an old store in Brooklyn, and remembered selling Rolleis like mine. I gave him my business card, and a few days after I got home, his grandson emailed me the photo you see here. Hi, I’ve been following your blog for a while and love both the Victoriana and your great contemporary work. I’ve been shooting 35mm on-and-off since college with a Pentax K1000, and have been getting into the “plastic/toy camera” thing over the last few years. I think I want to make the leap to a real (vintage) medium-format twin lens, but I’m not sure how to start or what to look for. eBay seems like such a crapshoot! Any advice? If you want to get into a twin-lens camera, a great starting point is a Yashicamat. They made a lot of different models, so I’m a little fuzzy on which one to point you toward, but it should be possible to find something in good working order for under $150. The late-model Yashicamats with built-in meters will cost more ($200+). A little more expensive but highly regarded are the Minolta Autocords. A Rolleicord would also fit the bill nicely and can be had for under $300. I went whole hog into a Rolleiflex 2.8 E, which I paid around $500-$600 for, and it needed a $300 servicing. On the upside, I’ve now got a camera that will last me another 30 years, so the amortized cost is quite low.